Sales people hate cold-calling. It takes many calls to get one connection and seems to get less-effective every year. Each time a prospect doesn’t pick up the phone, not to mention doesn’t call back, it feels like rejection. But prospecting for and winning new business is the core competency of advertising sales. Properly done cold-calling is not only a requirement to break the new business that is the life-blood of publishers, but cold-calling is an investment that pays dividends into the future. It just doesn’t feel like it at the time. Invest now for future results. Successful cold-calling for ad sales starts with proper prioritization of prospects. Are you organizing your prospect list to direct your efforts to the companies where you’ll have the highest potential? And if you know the right companies to cold-call, do you have the right contact information to direct your efforts to the right person? Let’s assume you do. If your efforts are directed to the right people, stop expecting instant gratification. Your prospects thinks they are doing fine without you. In today’s crowded business-days, it is very unlikely your prospect will drop everything to answer your call or respond to your email the first time or second time or even third time you reach out. 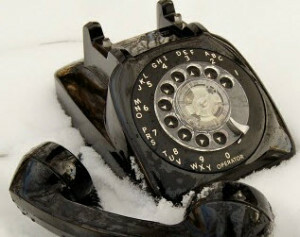 Think of your cold-calling in a different way: Cold-calling is advertising. And advertising needs frequency to work. Each cold-calling message is an advertisement for you and your company. Like an ad on TV, you have about 5 seconds to engage the prospects attention. When you do, you’ll have another 10 seconds to give the guts of your message. Each time you leave a voice mail, it must be followed up with an email to repeat that message and make it easy for them to respond. Your cold-calling message must be tightly written, and re-usable for every prospect within a category. So you’d have roughly the same message for all the real estate companies you call on, or all the restaurants or all the distilled-spirits brands you call on because each category competitor has roughly the same competitive problem. When you have a really intelligent and succinct message for your prospects, repeating it over and over sends a un-spoken message that is important too: You know enough about their business to understand their situation, and you believe in your solution enough that you aren’t giving up easily. The very best cold calling programs will include you saying “I called last week, and if I haven’t heard from you I’ll call again next week.” This gives the prospect the idea that they might as well talk to you, because you believe so much in your solution that you will be persistent. And finally, when they still haven’t responded, you call a week later as promised, effectively sending the message that you do what you say. Building the message of dependability and persistence will pay off when the prospect decides they are ready to engage. The prospect will call you, not your competitor, first because you have built a brand for yourself. It is this personal brand-building that you seek when you execute your cold-calling everyday. Tell your prospect when you’ll call back, and then do it. Repeat the cycle in a time-frame that fits the client’s business. Do they plan on a quarterly basis? Then repeat the cycle of calls leading into each quarterly planning time. Remind them you called several times a quarter ago. Then, when you leave your last message this quarter tell them you’ll be calling again in 60 days in hopes you’ll be calling at the right time for their planning. When you build and execute on an advertising sales plan like this you’ll not only win the immediate business available, but you’ll build your brand, and eventually your pipeline, for the future. Few, if any, of your competitors will do this. In the long run your investment of time and discipline will give you a spectacular return-on-investment. 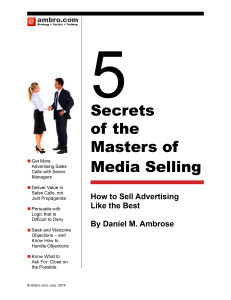 How to sell advertising involves three groups of skills. The first ad-sales skill is time and territory management: The skills and practices to get to the right place at the right time with the right information to make a sale. Nothing is more important. You can’t charm the client you don’t meet, nor can you persuade, handle objections or close. The second ad-sales skill group is engaging and persuading effectively. This involves logic, not just facts. And the third ad-sales skill group is the interaction skills that allow you to probe successfully for objections and opportunities, and to handle those objections and close deals.